Elected as the first full-time President of the European Council in November 2009, Herman Van Rompuy took office when the Lisbon Treaty came into force on 1 December 2009. In 2012, he was re-elected for a second term starting on 1 June 2012 and running until 30 November 2014. At the time of his first election, Herman Van Rompuy was Prime Minister of Belgium. Prior to that he had served in Belgium as Speaker of the House of Representatives (2007-2008) and in several government positions, including as Vice-Prime Minister and Minister of Budget (1993-1999), Minister of State (2004) and Secretary of State for Finance and Small Businesses (1988). A former economist at the National Bank of Belgium, Herman Van Rompuy began his political career in 1973 as national vice-president of his party’s youth council. He has held various responsibilities within his party and in the Belgian Parliament, serving in turn as Senator (1988-1995) and Member of Parliament (1995-2009). 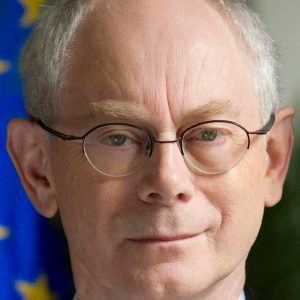 Herman Van Rompuy holds a Bachelor in Philosophy, and a Master in Applied Economics from the university K.U. Leuven. He was born in Etterbeek, Belgium, on 31 October 1947, and is married with Geertrui Windels; they have four children and four grandchildren.